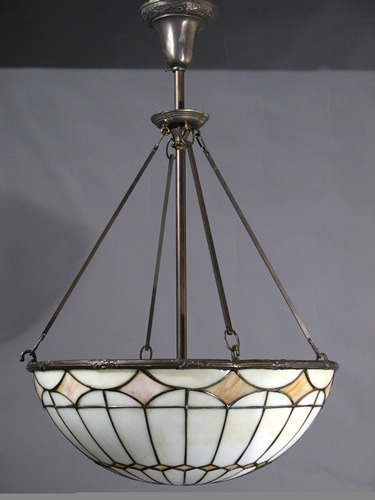 Wonderful 19 inch diameter Leaded Glass Inverted Dome with amber diamonds and white slag glass. This dome was made with 121 pieces of glass and has a really beautiful classic design that is mostly white. This is a great size for any room in an Arts and Crafts house. It has a 3 light cluster with porcelain sockets & will provide plenty of opalescence and illumination.